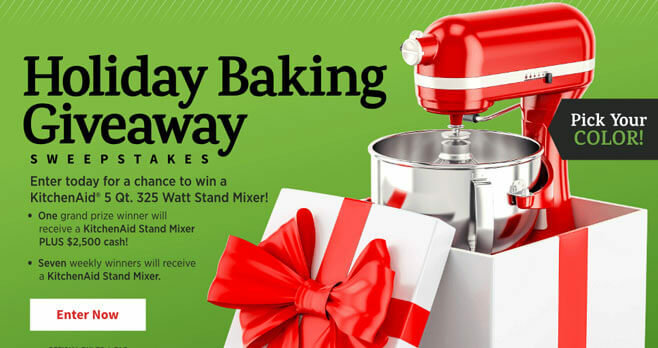 Just in time for Christmas, visit allrecipes.com/holidaygiveaway and enter the AllRecipes Holiday Baking Giveaway Sweepstakes for your chance to win a KitchenAid 5 Qt. 325 watt Stand Mixer plus $2,500 cash. The AllRecipes Holiday Baking Giveaway Sweepstakes is open to legal residents of the 50 United States and the District of Columbia, 21 years of age or older. The Sweepstakes begins at 12:01 a.m. CT on 11/10/18 and ends at 11:59 p.m. CT on 12/28/18. There is no limit to the number of entries each individual can receive throughout the Sweepstakes Period. The grand prize consists of one (1) KitchenAid 5 Qt. 325 watt Stand Mixer & a $2,500 check. Visit www.allrecipes.com/holidaygiveaway to enter and see Official Rules for details.